Dmitry Belosselskiy makes his house and role debut in the title role of Glinka’s Iwan Sussanin at Oper Frankfurt. Glinka’s epic 1836 opera, also entitled A Life for the Tsar, vividly depicts the life eponymous Russian national hero and martyr of the early 17th century’s Time of Troubles. Dmitry appears in an edition of the opera by Norbert Abels and Harry Kupfer which was first performed in Frankfurt in 2015 to critical acclaim. Later this season, Dmitry heads to The Metropolitan Opera for another role debut: Wurm, in a new production of Verdi’s Lusia Miller with a stellar cast including Alexander Vinogradov and Sonya Yoncheva. 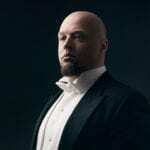 Other opera appearances include Simon Boccanegra at Teatro alla Scala and the Wiener Staatsoper, Don Carlos in Teatro Comunale di Bologna and Boris Godunov at the Bolshoi. Performances of Iwan Sussanin take place on 19, 21, 25 and 27 January. More details and tickets on the Oper Frankfurt website.